West End is famed for its quirky, community-focused vibe and multitude of dining and entertainment options. Strolling through the local Saturday markets and sampling local produce at the many restaurants on Boundary Street and Hardgrave Road prove to be popular activities on weeknights and weekends alike. There is an active live music scene at its local pubs and breweries. Locals also enjoy the close proximity to Southbank and the City which are both in walking distance. West End covers approximately 2 square kilometres and its five parks (Davies, Orleigh, Musgrave, Lyons and Bunyapa) occupy a generous 4% of the total area. The area is rich in history and culture, with many ethnicities represented. In particular, there is a strong Greek heritage, with the Paniyiri Festival celebrated in Musgrave Park each year. Due to West End’s central location, residents are spoiled for choice when it comes to public transport. The route 199 bus stops are dotted throughout the area, with a bus schedules to come past and take you into the City every ten minutes. Train stations are within easy walking distance with one located at Southbank and the other at South Brisbane. Also the CityCat stops at Orleigh Park and Southbank Parklands. Households in West End are primarily professional couples (aged 25-34 years) and there are also many young families drawn to the great local atmosphere and strong reputation of Brisbane State High School. The population is currently sitting around 9500 with 40% owner occupiers leaving the remaining 60% renting. Throughout the course of 2018 we have seen house sale prices stabilise at $1.048 million. Only twenty house were reported as being sold in the first half of the year and this rarity of properties coming up for sale generates huge amounts of interest from local buyers. The highest sale price achieved in this part of the year was $2.1 million for a house on 405sqm in Whynot Street. Demand for houses in the area is huge as the relaxed lifestyle, close proximity to Southbank, and access to quality schools in the area is attractive to young families. 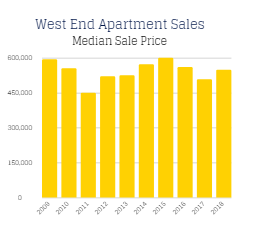 Apartments prices also appear to have stabilised with the median sale price sitting just below the $550,000 mark. It is a great relief that development of new projects has well and truly slowed down. Buyers looking to live in the area are loving the West End vibe and entertainment options while investors can look forward to earning some great rental returns and future long term growth. We can finally take a breath of relief with the completion of several major apartment complexes in West End. The developments will add long-term value to the area with their world-class facilities and high-end finishes. However, in the short-term, too many have been built and there is an oversupply in the rental market. It is reassuring to know that developers are starting to realise this and there have been a number of projects not proceeding and that this long period of growth is now coming to an end in 2018. The good news is that median rental prices have now stabilized with the median weekly rent for houses sitting at $560 and for units at $465. Although tenants are spoiled for choice, it is pleasing that our leasing team is able to rent out our properties quite quickly as we work close with our property owners to determine the appropriate market rate to advertise at. 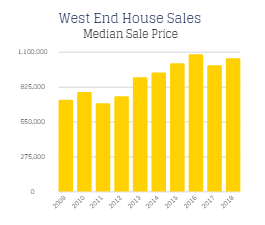 We consistently outperform the other 36 West End agencies as we maintain the largest share of leased listings and our average days on the market in 26 days compared to the industry average of 58 days.